Samsung is now mass-producing what it said is the world’s fastest mobile memory, an embedded MultiMedia Card (eMMC) that comes in 16GB, 32GB and 64GB densities for next-generation smartphones and tablet. Aiming for the title of the fastest embedded memory, the chips are said to be capable of peaking at 400MB/s, enabling quick application booting and reduced loading times. The latter two storage choices will be able to operate at 250MB/s sequential read speeds and write sequentially at 90MB/s. According to the company, these modules are over 10 times faster than class 10 external memory cards. By comparison, Samsung’s current eMMC Pro chips (based on the 4.5 specification) offer up to 2,000 IOPS random write and 3,500 random read IOPS, and 150MB/sec sequential read and 50MB/sec write rates. “With timely mass production of our ultra-fast eMMC PRO lineup offering a more than 10x performance increase over external memory cards, Samsung will accelerate the spread of high-end mobile devices as the market for devices with larger screens and more multimedia functionality expands even further,” Samsung’s vice president of memory marketing, KyongMoo Mang, said in a statement. The company asserts that the 32GB and 64GB can also obtain random read and write speeds of 7000 IOPS. 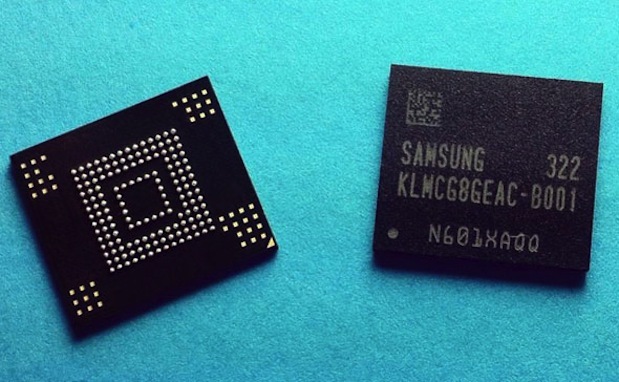 The Samsung eMMC 5.0 modules have been developed by leveraging the 64Gb 10nm class NAND flash technology. Additionally, the conglomerate has integrated its own NAND controller and firmware into the modules. Samsung’s 16GB, 32GB and 64GB eMMC 5.0 devices come in 11.5mm x 13mm packages, making them suitable for mobile devices where space on the printed circuit board is extremely limited. Again, just like the 3GB of RAM, we would expect the Galaxy Note III to be the first device that uses this faster and more capable storage chip.